We’re still keen to gather as much input as possible – what do you think ought to be up for discussion? 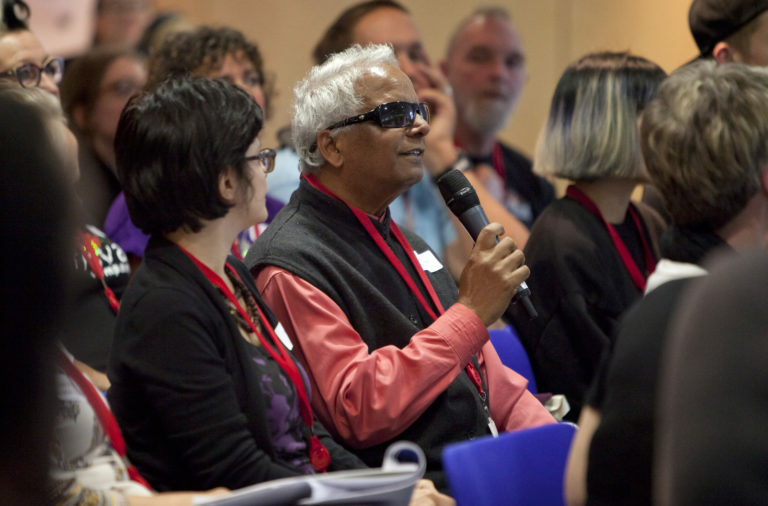 What, in your opinion, would the most important topics be at a global symposium on disability-led arts in the 21st Century? What issues relating to disability arts would you like to see explored on the global stage? Help us to shape the programme by tweeting your thoughts – using the hashtag #UnltdSymposium – or commenting on our Facebook post to let us know before midnight on Sunday 10 December 2017. Unlimited supports and celebrates all disability-led arts, and we’re keen to amplify the change which we have been a part of and emphasise the quality and breadth of artistic work by disabled artists and the far reaching partnerships which help make them happen. It’s important for us that we involve initiatives outside of Unlimited which share similar context/values and focus on what is needed to embed such change within the cultural sector globally. We want the Symposium to be an international space for real dialogue; to give an engaging, interactive platform to the ideas and topics that need to be discussed. We want it to look to the future, and to reflect global disability arts perspectives, not just those relating to the UK or to Unlimited. In order to do this, we’ve been asking people to share their thoughts on what topics they think we should focus on, either tweeting using the hashtag #UnltdSymposium or commenting on our Facebook post. We’ve been logging every response that’s come in through the hashtag #UnltdSymposium in order to work out the most popular areas for discussion, to be voted on in early 2018 in order to form the symposium programme. As we’d love to gather as inclusive, broad and diverse a range of perspectives and opinions as possible, please don’t forget to spread the word and help us reach out to others across the world to give their viewpoints too! You can share our Facebook post, retweet our tweet or share this blog. Whilst we want people to find out new things and make new contacts, we also want the event to be focused on action – we are looking for everyone to develop achievable and actionable goals as a result of attending to move the situation forward. You can stay up-to-date with the Unlimited Symposium as it develops and progresses, as well as our future news, opportunities and events, by signing up to our e-newsletter.